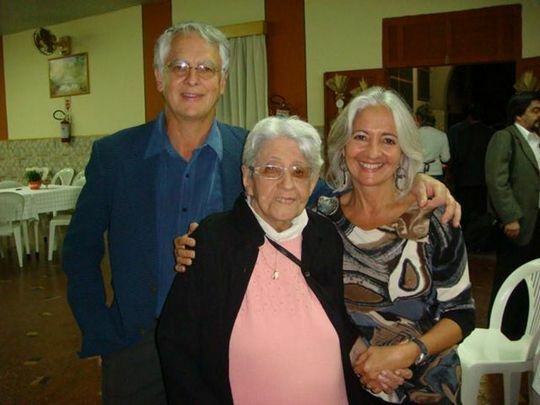 Far away in Brazil, today she celebrates her 91st Birthday! We are not there for the occasion, but I share a photo taken one year ago. See you in November…. countdown started! 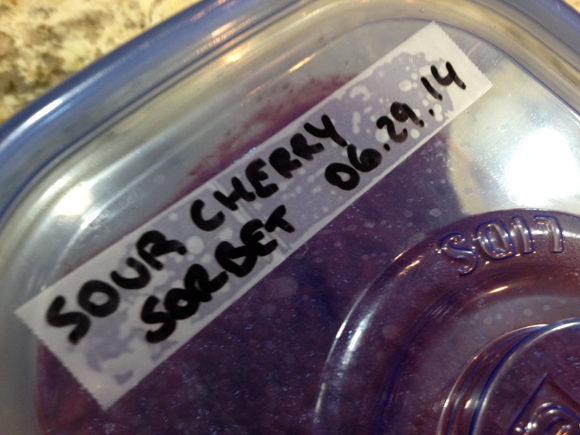 On my last In My Kitchen post, I mentioned we got to pick sour cherries from a friend’s tree. It was a first time for me, and I admit that it surprised me how much work was involved. Of course, picking the fruit requires that you climb up a ladder carrying a basket, and spend quite some time in a daze-inducing repetitive activity. Nothing wrong with that, except that all that Zen might make one less careful. It is tempting to stretch the body just a little more to reach that great looking cherry winking at you, maybe a tad too far. Thankfully, it all had a happy ending, no falls, no broken bones. We went home with a load of fruit ready for the next step: sorting. The basic goal is to get rid of the cherries that have worms inside. That information was not conveyed to me BEFORE we picked the fruit. I wasn’t thrilled, and made sure my beloved husband got the message loud and clear during our drive home. The thought that I had my hands on stuff potentially hiding slimy creatures was unbearable. Unfortunately, it was too late, I had already been exposed to danger. So how do you sort the cherries? You dump them all in a container with water. The ones that float very likely have worms. The ones that sink to the bottom better be worm-free because next comes pitting. Finding a worm together with the pit would be extremely no bueno. No bueno as the end of me. Add the cherries, and the banana to the bowl of a food processor. Process until smooth, cleaning the sides of the bowl a couple of times. Add the lemon juice, the sugar, and the water, and process everything together until fully smooth. Taste and adjust the sugar level, adding more if you like. Add the vodka, give it a final mix. Keep the base in the fridge overnight or for at least 4 hours to cool completely. Place the mixture in your ice cream maker and churn it according to the instructions of the manufacturer. Scoop into a freezer-safe container. Comments: All credit for the sorbets featured in the blog in the past couple of years should go to Phil, even if he fooled me into handling worm-containing fruit. He comes up with all sorts of flavors, each and every one of his concoctions turns out great! The only fruit he cooks down before churning is apricot, all others go in fresh. He always includes a ripe banana, and in his latest versions a tablespoon or so of some type of alcohol, usually vodka or rum. 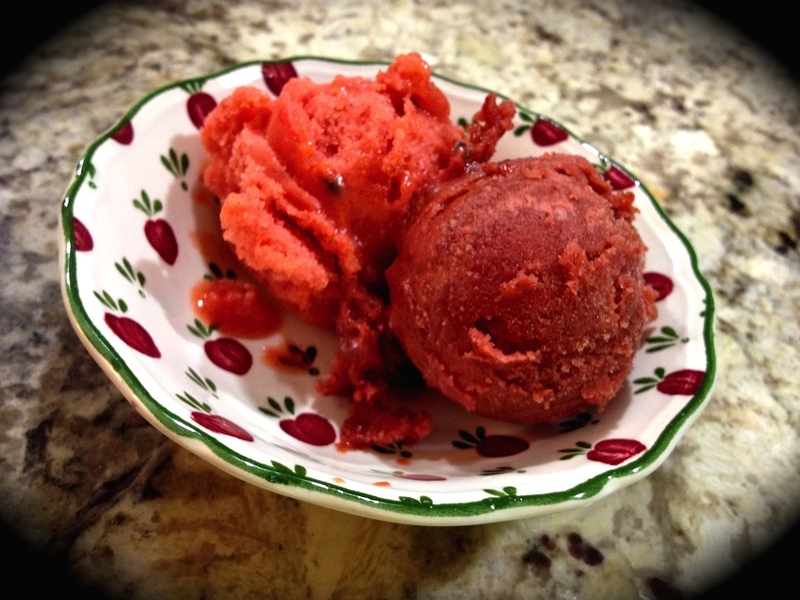 They give the sorbet a creamier consistency when frozen, and you will not taste any alcohol. Once more I should add that we like our sorbets with very little sugar, you might find that our versions are too tart for your taste. Adjust accordingly, tasting the base before you churn it. As you can see, it often takes me a little time to go from making a recipe to blogging about it, but better late than never, I wanted to get this post out before summer is over. Summer and over is never a good combination. Oh, the pain, the incredible cruelty of what lays ahead for me… Autumn first, then misery. « DRUM ROLL PLEASE….. ONE MILLION PAGE VIEWS! IT’S GIVEAWAY TIME! 91! Wow – go mum! Hope your birthday was incredible. If I popped a cherry with worm inside I PROMISE you I would collapse. Is it weird if I say that I love pitting cherries and getting all my hands covered in “blood”? I do have a dark/splatter side. Yes, you do have a dark side, I can tell! 😉 My Mom will be thrilled with the iron woman comment – I hope some of it rubbed on me, genetically speaking…. sour so I eat some all by themselves. The sorbet is beautiful and I’m sure it’s delectable, too. Happy birthday to your mom, and thank you for the picture. You have good genes. Your mom looks much younger that her age, and you and Phil just get younger, or so it seems to me. Happy birthday to your Mother, Sally. I hope this year has many wonderful things in store for her. Floaters are no bueno….got it! there you go – no bueno. This looks so inviting. Lovely colour. Great pictures. Happy Birthday to 91 year old mum. I know it was hard not being there to celebrate. Birthdays are tough for me. I’d console myself with some of this outstanding cherry sorbet. Hopefully minus worms. Gosh that made me laugh. At least the thought of worms in the cherries doesn’t make you itch, like the thought of fleas or gnats? Maybe it makes you squirm instead? You are one brave woman Sally. But the results look superb. I use minimal sugar as well, so the recipe would be perfect for me! Happy birthday to your sweet Mother! Thanks Mimi! Yes, it makes me ITCH and SQUIRM, and want to run away screaming like a mad woman…. Phil got an earful of my thoughts, as you might imagine.